Spring isn’t too far off, but that doesn’t mean you can’t yet enjoy a dish with ingredients straight from the garden. 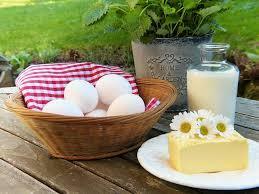 Enjoy an omelet with yummy greens and a little yogurt and cheese to start the day off right. It’s proof that a hearty breakfast doesn’t need meat! 1. On the stove, heat 1 teaspoon of the oil in a skillet and cook the onion for 2-3 minutes or until soft. 6. Heat the rest of the oil in a heavy-bottom skillet. Pour in the egg mixture and cook until just set on the bottom but still wet on the top, 1 minute.